$3.49 & FREE Shipping on orders over $59. This bottle brush design has stood the test of time. This traditional design Beer Bottle Brush, is perfect for cleaning 12 to 22oz beer bottles. If there is any stuck-on residue or dust in the bottom of your bottles the rounded end of the brush will reach in and scrub it out! Includes circular metal loop for hanging. 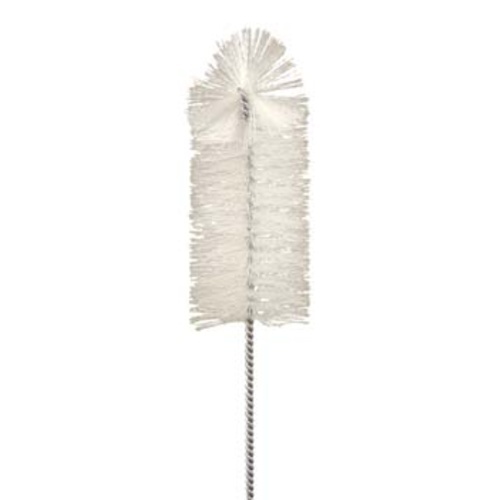 Bristles are 2.75" in diameter with an overall length of 16"
Love this brush for cleaning. We are out of bottle cleaners. I thought I should pay more attention to cleanliness. I bought this to replace the one I wore out. Hopefully this one lasts a long time too. By all means, it appears that it will. I have a large assortment of bottles. I have found that 25 to 30% have mouths that I can barely jamb this brush into. On top of that it is a struggle to pull the brush back out. The rest work fine, but I am thinking I am going to have to sort and discard the tight ones. I have also thought of modifying the brush by trimming the bristles, but that would make it less efficient overall. This thing works very well for cleaning my wine bottles. I straightened out the one in so I can put it into a cordless drill. So it makes Cleaning Out The Bottles really easy. If you have old bottles that have not been rinsed after use, you will NEED one of these to make sure all the gunk is scrubbed out. This Brush is great for getting the stuck crud on the bottom of bottles. Heavy duty thick bristles that will get up any gunk or grime in those forgotten bottles. Would buy again.